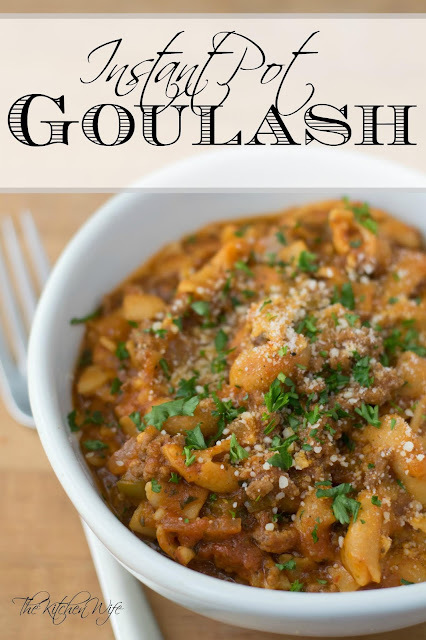 This may sound a little silly, but growing up one of my favorite meals was something called goulash. 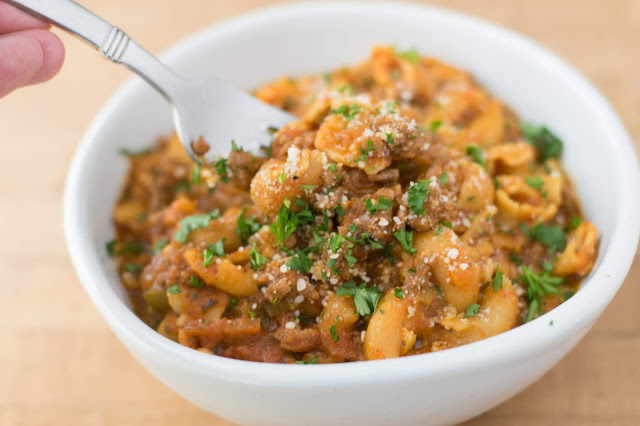 I mean, in essence it's just meat sauce combined with elbow macaroni, but man it was always so good! There are a million different ways to make this dish, from a million and one different regions, but today I'm going to be sharing the recipe that I grew up with. Oh, and did I mention the best part? We are going to be making this in under 30 minutes start to finish in our instant pot? Oh yes! This is a one-pot meal that I know everyone is going to love so let's get started! I know I say this a lot, but you may already have everything you need to make this recipe in your fridge and pantry. I guess that is just the way I cook really. To begin you will need to turn your Instant Pot on to Sauté. Season with salt and pepper, break it up with the spatula, and let brown. Mix it all together and let the meat finish cooking till it is brown and no longer pink. 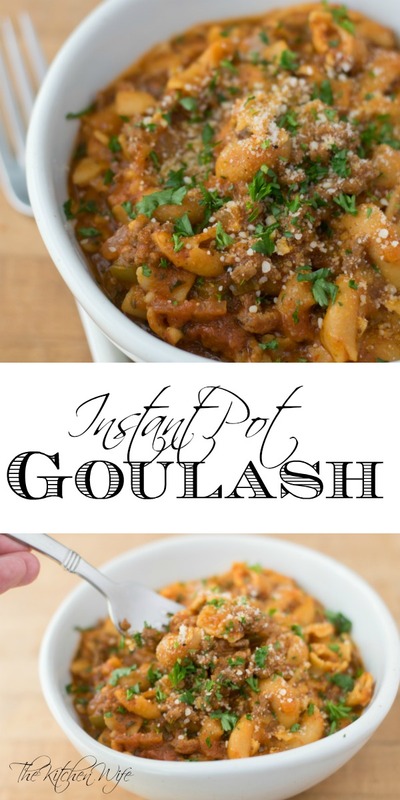 Fill the jar from the pasta sauce with water, give it a shake, and then add it to the Instant Pot. This next step is not necessary, but I like a sweeter sauce. Add the sugar to the sauce and give everything a good stir. Turn the Instant Pot to MANUAL and set the timer for 10 minutes. Remember, it will take about 10 minutes for the Instant Pot to come to pressure. Once the 10 minutes has elapsed, turn the valve to VENTING for a quick release of the pressure. When all the pressure has released remove the lid and your goulash will look like this. You may think, OH NO this is a water mess, but don't freak out. Just give it a little stir and, just like magic, you will see everything come together! Now all you have to do is serve it up and you are ready to eat! The pasta is perfectly cooked and full of flavor. I like to top this with a little fresh parsley and some grated Parmesan, but my dad used to melt a ton of mozzarella on his. Add a little chopped salad on the side and dinner is ready in about 20 minutes! 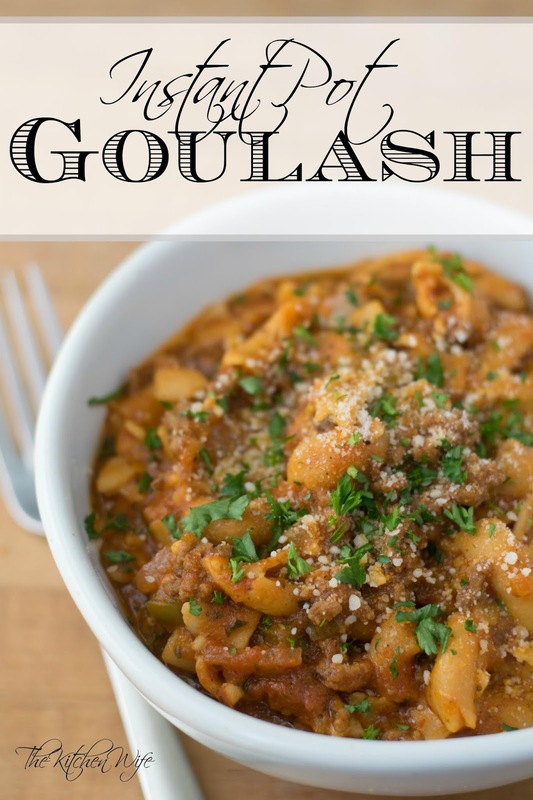 I know you are going to love this Instant Pot Goulash so get in the kitchen and give it a try TONIGHT! Turn the Instant Pot to SAUTE and add a little oil. Add the ground beef to the instant pot, season with salt and pepper, and let brown. Just before the meat is fully cooked add the onion, green pepper, garlic, and Italian seasoning. let the meat finish growing and the onions and green pepper to become soft and translucent. Add the pasta and jar of sauce. Fill the sauce jar with water, give it a shake, and add it to the Instant pot as well. Add the sugar to the Instant Pot, give everything a stir, and taste for seasoning. Turn the Instant Pot to MANUAL and set the timer for 10 minutes. Allow the Instant Pot to come to pressure. Once the 10 minutes has elapsed, turn the valve to VENTING for a quick release. When all the pressure has release, remove the lid and give everything a stir.